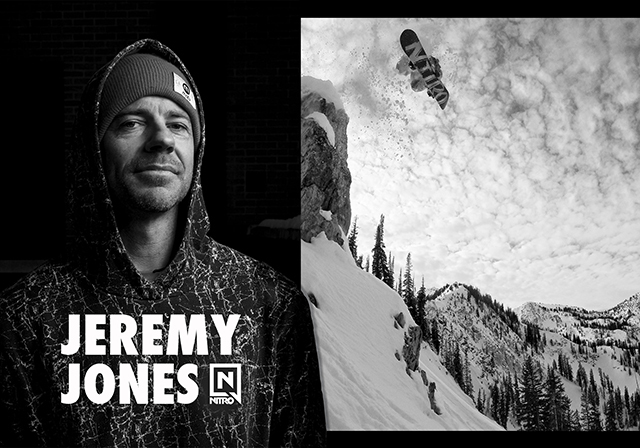 Salt Lake City, UT – Feburary 2016 – Nitro Snowboards (Rider Owned), the 27 year old snowboard brand is thrilled to announce its newest addition to the family – Jeremy Jones, one of the most influential snowboarders of the last two decades. Beyond continuing to film new video parts, acting as a brand ambassador, and slaying anything in his way Jeremy will be inspirational and instrumental in bringing new and improved products to the Nitro line. "Jeremy is hands down one of the most influential and progressive snowboarders of our time and continues to push boundaries year after year, because he absolutely loves everything about snowboarding and having a good time. This is the exact reason we wanted to partner up with Jeremy to help us continue our goal of spreading the passion that snowboarding is to us at Nitro." said Knut Eliassen, Nitro Team and Marketing Manager. Jeremy is a perfect fit to the Nitro slogan "Built For Good Times", and is an amazing ambassador of snowboardings heritage and future of innovation at Nitro. He is one of the originals, style innovator, trick master, film part legend (from Simple Pleasures, Decade, Resistance, Shakedown, and the list goes on), and one of the few snowboarders who have set the standard of snowboarding several times throughout his career. He has a place in history as the king of all around snowboarding, from the streets to the backcountry. We look forward to what he has next for snowboarding and Nitro.